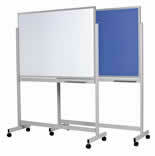 Our mobile whiteboards can be constructed with a Porcelain or Commercial surface depending on your requirements. Our Porcelain boards have a lifetime surface warranty and are recommended for educational institutions. Commercial whiteboards have a 5 year surface warranty under normal use and care. 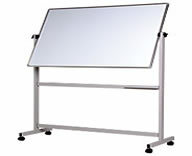 Mobile whiteboards can be pivoting or fixed to the frame. Price Guarantee: We will beat any legitimate written quote of our competitors for the same product. Simply fax a copy of the written quote and we will happily beat it. Click here to specify the size and style of Mobile Unit you require and where it is to be delivered. We can then send you an exact quote. all Mobile whiteboards and pinboards during this month!